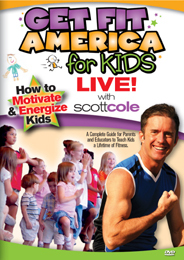 Get Fit America for Kids LIVE! 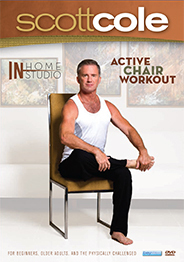 Stand up, sit down, and get strong and flexible with Scott’s Active Chair Workout. Designed to increase balance and stability, the Standing section offers easy-to-follow upper and lower body strength and stretching exercises that activate and elongate all major muscle groups. With special emphasis on breathing and body awareness, the Seated section covers non-weight bearing therapeutic range of motion exercises, functional applications, and a full-body stretch. BONUS sections include The Seated Sofa Stretch and White Light Guided Imagery for stress-reduction. * Great for home or office and all levels of exercisers, especially beginners and physically challenged individuals. 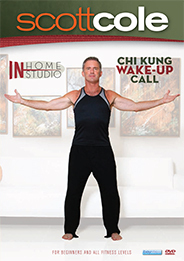 Energize your Body, Mind, and Spirit with Scott’s fluid and flexible Chi Kung Wake-Up Call. Designed to re-activate your internal Energy (Chi), Scott’s renowned sequencing of ancient breath-filled Chinese Chi Kung, combined with modern stretches and applications allow you to truly lighten up, loosen up, and let go of tension and stress, while centering your Chi, bringing your body back to Life. 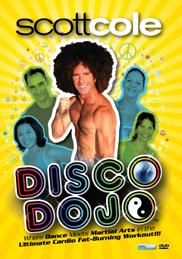 BONUS sections include The Golden Ball, Dance of the Five Elements, and Partnered Push Hands. *Great for all levels of exercisers, particularly beginners, physically challenged, and stress-challenged individuals. Let go of stress, work out the kinks, and prevent injury with Scott in his Gentle Yoga Stretch. Combining standing and seated Yoga poses, slow breath-filled stability exercises, energizing movement therapy, and innovative stretching, this non-jarring back-friendly program is designed to keep your body limber and strong, and your mind relaxed and at ease. BONUS sections include Standing Partnered Yoga Stretching Sequences. *Great for all levels of exercisers and especially helpful for beginners and physically challenged individuals. 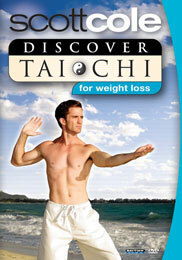 GET FIT inside and out with Discover Tai Chi for Fitness!!! 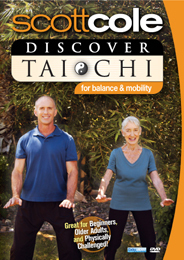 Discover Tai Chi for Fitness offers beautiful breath-filled Chi Kung, powerful Yang-style Tai Chi postures, innovative stretching sequences, effective chair exercises, life-enhancing philosophy, and the opportunity for YOU to join thousands of healthy people as part of the Discover Tai Chi family!!! 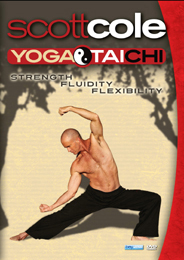 Feel the Yin/Yang balance of flowing Chi Kung exercises, grounding Tai Chi postures, and prana-filled Yoga poses, along with movement therapy, innovative stretching and seamless transitions.Advanced BONUS sections include: Chiseling Yoga Abs and Core, Yoga Warrior/ Tai Chi Snake Creeps Down Vinyasa, and the Tai Chi Martial Da Lu. Yoga Tai Chi with Scott Cole is a complete workout experience, concluding with Scott’s famous White Light Guided Imagery Savasana Meditation. 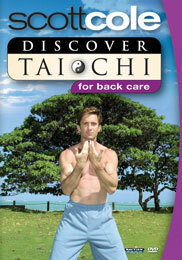 Yoga Tai Chi is great for all levels of exercisers. Great for beginners, older adults, and physically challenged, this workout is both fun and effective. 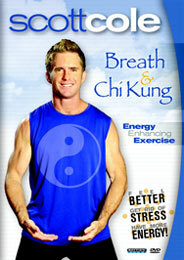 Combining both Breath and Chi Kung AND Chair Strength and Stretch,this 2-DVD box set is not only a great value but gives you 2 programs designed to restore vital breath and energy PLUS bring physical, mental, and spiritual balance back into your life. Best of all it is easy to do, and great for beginners and seniors. Scott Cole's Chair Strength & Stretch tones and sculpts the hips, buns, and thighs, while working the core and back muscles through chair stability training. Post-toning, Scott leads you through a complete full-body stretch of all major muscle groups, guaranteed to help you improve posture, increase flexibility, and reduce stress. This program is great for all shapes, sizes, and levels of exercisers, including beginners and mature adults. Scott Cole's Breath & Chi Kung program brings energy back into your body while improving strength, balance, flexibility, and lung capacity. Best of all, IT'S EASY TO DO!!! With frequent practice this easy-to-follow program will help relieve back pain, release frozen joints, and restore energy to its natural free-flowing state. Snake Creeps Down ... Playing the Pi Pa ... 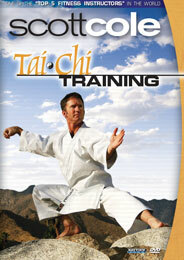 Wave Hands Like Clouds ... explore the mysteries of the ancient martial art of Tai Chi movement. Inspired by the Yang Long Form, this video incorporates select Tai Chi postures, Chi Kung, and Taoist philosophy. Balance, strength, flexibility, and stress reduction are all part of the Discover Tai Chi Workout Essentials for Beginners experience. This DVD is great for beginners of all ages including mature adults. 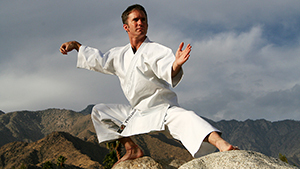 Renowned Tai Chi expert Scott Cole has empowered audiences in over 30 countries as an author, speaker, and wellness motivator. 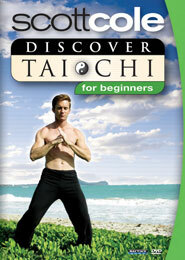 Now you can join him in graceful Tai Chi postures like 'Dance of Five Elements' and 'Standing Tree in Breeze'. This workout is an excellent way to energize and begin your day! 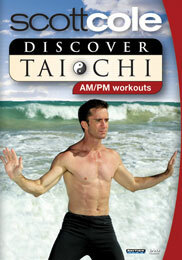 Join wellness expert Scott Cole, both in his personal Tai Chi studio and on the exotic beaches of Hawaii, on a journey toward complete relaxation with the Discover Tai Chi PM Workout. This 30-minute workout features a medley of Yang style Tai Chi postures and healing Chi Kung exercises to help you completely relax at the end of the day. Discover Tai Chi for Weight Loss will help you create the mind/body connection that provides internal awareness and understanding. This workout includes strength, flexibility, and fat burning cardio training. 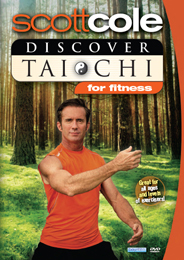 Filmed in a studio and on the beautiful beaches of Hawaii, Discover Tai Chi for Weight Loss features both slow and fast Yang style Tai Chi postures and healing Chi Kung exercises. BONUS: Includes Scott's "Path of Least Resistance" Meal Plan. Join Scott Cole and Tom Seabourne (and their 12 pack) to discover how to turn your "AB" into ABS!!! Best Abs on Earth DVD contains a multi-dimensional Full-Body core-conditioning workout featuring fat-burning cardio-interval training, power yoga, martial arts drills, focused abdominal exercises, gymnastic strength work, stretching, and a BONUS Party Pump section. Tai Chi Training features an inspiring outdoor introduction to Tai Chi, plus 30 minutes of slow, focused, energy-building, balance-enhancing, stress-reducing Chi Kung movements and Tai Chi postures, followed by a 20-minute fat-burning "Cardio Chi" section, ending with a full-body cool down stretch. Great for all levels of exercisers. "A delicious, nutritious meal for the body"
Join Scott on a multidimensional journey of proven relaxation techniques, now available for the first time on DVD. Millennium Stretch Classic Gold Edition features the Original Millennium Stretch program PLUS the Partnered Stretch for 2. This is the ultimate stress-free fusion training DVD for instructors and participants, and includes all-new footage featuring Scott's world-renowned 8 Poses of Empowerment. 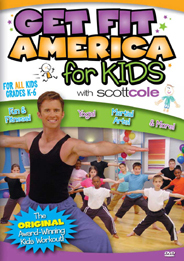 "Get Fit America for Kids is designed for ALL children. It is non-competitive, joyful, mindful, and FUN. See for yourself, and let's all work to keep America's children happy, healthy, creative, and conscious."